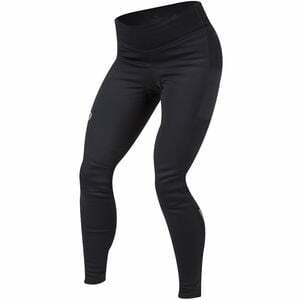 Product Condition: The Elite Escape AmFIB Cycling Tight - Women's is in Excellent condition. This item was previously owned for 3 weeks. The following observations were made concerning this item. When Old Man Winter throws a layer of frost on the ground, don't let it keep you inside. With the help of Pearl Izumi's Elite Escape AmFIB Cycling tights for women you'll be hitting the pavement with the vigor of spring well into the winter. The Elite Escape AmFIB tights offer a super soft and warm embrace from thermal fleece that's topped with PI Dry DWR coating to keep water, snow, and sleet rolling off of you. Protective AmFIB softshell fabric is strategically paneled in key exposure areas to add an extra shield from the elements as you ride into the storm. Your rear-end will feel supported and comfortable, too, with Pearl's Elite Escape 1:1 chamois that offers a free-floating 4-way-stretch top sheet that brushes gently against your skin, backed with a 2-layer suspension core for plush and supportive comfort. Moving down from the chamois, these tights are hit with BioViz elements to increase your visibility in low lights, and down further, 7-inch zippers on the lower leg offer plenty of room for getting in and out of your tights with bulky winter socks.